This Exchange provides the principles, with evidence from research, for optimising pasture growth, utilisation, environmental management and livestock performance from pastures. Tools and processes are provided to guide planning and monitoring and apply the principles to achieve the best outcomes for the given farm system. Getting the most out of your pastures with grazing management involves decisions which influence pasture growth and utilisation throughout the seasons over the whole farm. The aim is to maximise the long term profitability from livestock production while managing feed surpluses and deficits within and between years; maintaining or improving pasture composition and environmental conditions including ground cover, biodiversity and water use. Making improvements to grazing management can also contribute towards lifestyle objectives by providing the owner/manager with more control over feed supply, so feed excess and deficits can be identified ahead of time. The first step in developing a grazing strategy for your farm is to understand the basic principles for optimising pasture production, utilisation and composition; and livestock performance. These are listed below. Persistence of perennials and prevention of soil loss can be achieved by maintaining >70% ground cover and >800 kg DM/ha herbage mass on flat/undulating country; and >90% ground cover on steeper country. Pastures will optimise their growth when kept in phase 2 , when herbage mass is 1200-2500 kg/ha. At less than 1200 kg/ha, growth is limited by leaf area. At greater than 2500 kg/ha, growth is limited by light. Reproductive performance will be optimised when ewes are fed according to Lifetimewool energy intake and condition targets , and cows according to More Beef from Pastures guidelines . Perennials require rest after grazing, and especially at the autumn break, for tillers to restore carbohydrate levels in the roots and stem; resulting in greater rooting depth, persistence and growth. 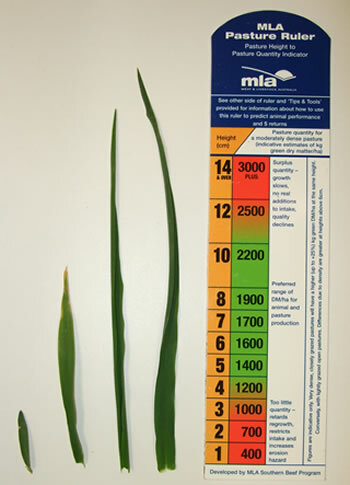 Leaf stage of perennial grasses can be used as a guide for determining the length of the rest period. Leaf appearance rates vary with soil moisture and temperature so required rest periods are longer in summer and winter and shorter in autumn (after the break) and spring. Resting for longer than necessary will compromise feed quality. Manipulation of pasture composition requires understanding of the reproductive mechanisms and response of desirable and undesirable species to the position in the landscape, rainfall, grazing management, fertility, pH and chemical control. 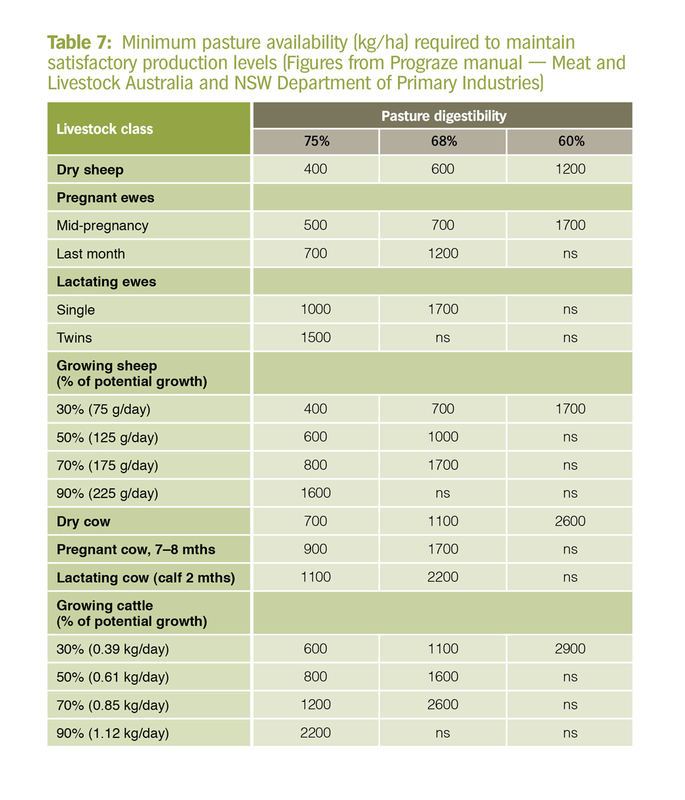 Stocking rates, lambing and calving times should be set according to minimum pasture benchmarks (for livestock and pastures) and supplementary feeding thresholds throughout the growing season (see EverGraze Exchange – Livestock systems for profitable and sustainable use of perennial pastures ). Applying the principles to establish grazing residual and rest period targets requires flexibility, and at times compromise, to fit with management preferences and to achieve optimum utilisation while meeting pasture management and livestock nutritional requirements. Including a variety of summer and winter active perennial pasture species, placed in the right part of the landscape, will provide flexibility and options for managing feed surplus and deficits in variable seasons (See EverGraze Exchange – Selecting pastures for place and purpose) . Fodder conservation is also important for managing seasonal variability. Rotational grazing allows for sufficient rest of perennial grasses which can result in greater persistence compared to continuous grazing. Rotational grazing (especially with long rest periods) can also result in more grass dominance and lower broadleaf weed and clover composition compared to continuous grazing (see Broadford Grazing Experiment ). In strong perennial grass stands where flexible stocking rates are used to manage to herbage mass and ground cover benchmarks, differences in pasture composition resulting from rotational grazing or set stocking can be less evident (see Orange Proof Site ). Lower grazing intensity allows for selective grazing and therefore higher dietary quality compared to higher intensity grazing systems which promote higher utilisation and reduce the ability for the animal to select their diet. This results in higher lamb liveweight gains (by 5-10%) but no difference in wool production (there is less evidence of this for cattle) (Orange Proof Site , Broadford Grazing Experiment, Balmoral ). Increasing the intensity of grazing systems (eg. changing from one paddock to four paddocks or four paddocks to 20 paddocks) results in higher pasture utilisation, increased pasture growth, and greater control over feed supply and demand, so that feed is available for longer in the growing season. This increases stocking rate potential by 10-20%. Stocking rate increases may be higher on farms with more variable landscape and therefore greater potential to increase utilisation. Higher stocking rate potential under rotational grazing usually outweighs benefits of set stocking to individual liveweight gain, resulting in higher production per hectare (Broadford , Orange, Balmoral ). Increasing grazing intensity results in more even distribution of soil nutrients such that maintenance phosphorus requirements are reduced by approximately 0.2 kg P/DSE/ha (Broadford). Variable landscapes can be mapped to production zones or land management units defined by factors such as soil type, slope, aspect, water holding capacity, pasture composition (or suitability for different pasture species), and soil fertility. Production zones will differ in their stock carrying capacity and fertiliser requirements. Fencing to production zone will result in higher pasture utilisation and stocking rates. The return on investment from improved grazing management declines with increasing infrastructure requirements (Orange Proof Site). It is best to start by combining mobs and rotating around existing paddocks, and adding infrastructure where there are obvious production zone or land management unit differences and therefore significant utilisation benefits. 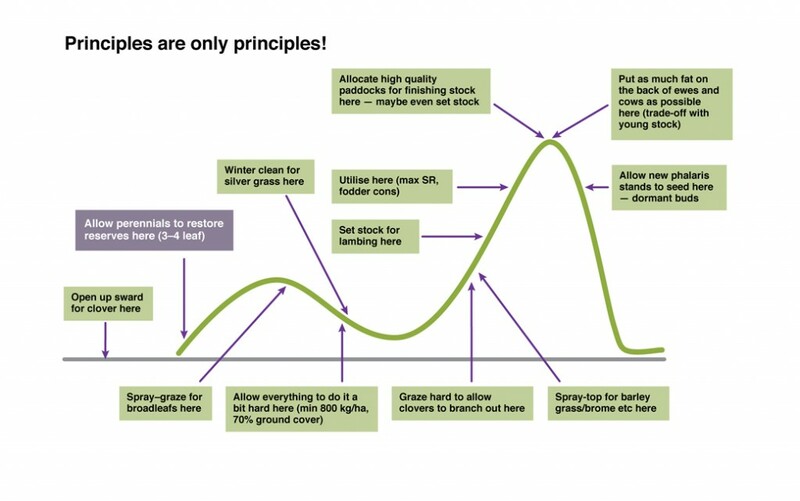 Once the above principles are understood, a plan can be developed to apply the principles to your unique farm setup and management style. It’s important to recognise that principles are only principles, and there will be an element of compromise in applying them to your own farm situation, as well as in balancing the needs of both pastures and livestock throughout the seasons. Decide on the intensity of your management regime – intensive rotational grazing, simple rotation moving between a few paddocks, or set stocking (see Orange EverGraze Proof Site , Broadford Grazing Experiment and Grazing Management – sorting fact from fiction ). List the mobs of sheep and/or cattle on the farm for each time of year, and their requirements. If your aim is to intensify your management, consider where mobs can be combined to allow for movement between more paddocks (See Planning grazing strategies ). Establish benchmarks for feed on offer and/or herbage mass based on livestock and pasture management principles (below). Develop whole farm winter and summer fodder budgets to ensure that these benchmarks will be met; make adjustments to stocking rates where required. Develop a set of seasonal management actions or rules . Ensure stock containment/sacrifice paddocks, fodder reserves, plans for purchase of supplementary feeding and/or adjustments to stocking rates are in place for when minimum pasture benchmarks are met. For each season, allocate mobs to groups of paddocks according to management requirements. Use the basic principles together with fodder budgets and constant monitoring of livestock and pastures to guide the movement of stock between paddocks. In developing your plan, you might also identify opportunities to make changes to your farm setup to optimise production and utilisation. These may include changes to livestock systems (eg. stocking rate, lambing/calving times), pasture species , or fencing and water infrastructure. The EverGraze Pasture Improvement Calculator can be used to give an indication as to the costs and likely benefits. The Orange EverGraze Proof Site and the Broadford Grazing Experiment also provide information on the costs and benefits of intensifying grazing strategies. The first grazing principles involve understanding the needs of pastures and livestock for maximising production and survival. Principles for managing persistence and production of pastures consider soil fertility requirements; the length and timing of rest periods; minimum residual herbage mass for achieving recovery from grazing and persistence; minimum ground cover targets; and specific strategies for manipulating composition and maximising utilisation. These principles need to be combined with feed on offer (FOO) and pasture quality targets and management to meet livestock production requirements, and serve to determine the boundaries around stocking rate potential and appropriate lambing and calving times. Ground cover, residual herbage mass and FOO benchmarks provided in this section can be used as a guide for preventing soil loss, ensuring the persistence of pastures, maximising pasture growth and meeting livestock production targets. Once the benchmarks are understood, fodder budgets can be used to determine appropriate stocking rates, decide on the most appropriate lambing or calving time, and determine how long to leave stock in each paddock in a grazing rotation. Persistence of perennials and prevention of soil loss. At all EverGraze research sites (based on native or improved perennial pastures), stock were removed and fed in containment areas when pastures reached the above herbage mass or ground cover benchmarks, and this resulted in the persistence of perennials and prevention of soil loss at all sites. Where local benchmarks were available (for the Hamilton site ), it was shown that profitability significantly above local benchmarks was achieved while these management criteria were in place. Where different management regimes (rotational grazing and set stocking) were compared at Orange (NSW) and Chiltern (Victoria), native pastures were persistent, regardless of whether rotational grazing or set stocking were used. 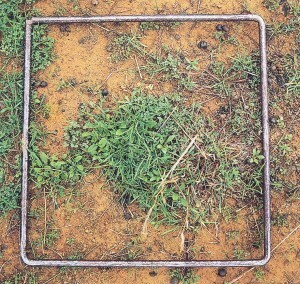 Stock containment area on kikuyu at the Albany EverGraze Proof Site, WA. Groundcover can include loose litter, dung and rocks which act to protect soils from the impact of rain drops which can dislodge soil particles. 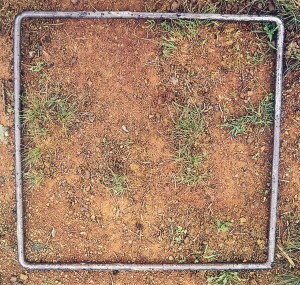 In areas prone to wind erosion, the cover needs to be connected to the soil surface. 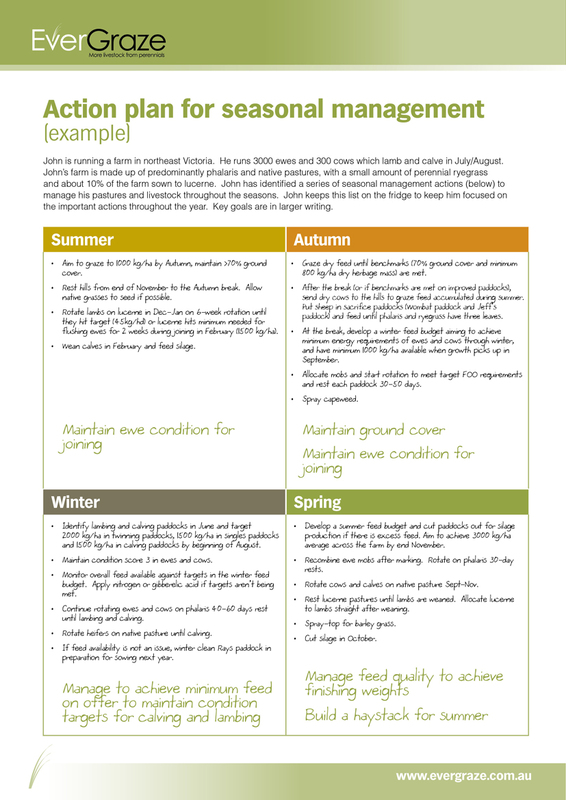 Summer and autumn are critical times for managing ground cover. Set stocking during this time can result in overgrazed pastures unless stock are removed once ground cover starts to decline below benchmark figures. The amount of pasture litter retained on the soil surface will also affect sub clover germination. Approximately 1000 kg/ha of dead dry matter at the autumn break will allow germination. This is about a handful of dead litter (9 grams) in a 30 cm square (or square foot) area. Managing to critical ground cover and herbage mass benchmarks requires that stocking rates are set according to the carrying capacity (See EverGraze Exchange – Livestock systems for profitable and sustainable use of perennial ). Herbage mass should be assessed and a fodder budget developed at the end of spring to plan early for feed shortages in autumn. Suitable containment areas or sacrifice paddocks should be available for when the critical benchmarks are reached. Kikuyu, bent grass or couch grass paddocks with stable soils and access to quality water are ideal. Pastures growth will be optimised when kept in phase 2, when herbage mass is 1200-2500 kg/ha. At less than 1200 kg/ha, growth is limited by leaf area. At greater than 2500 kg/ha, growth is limited by light. 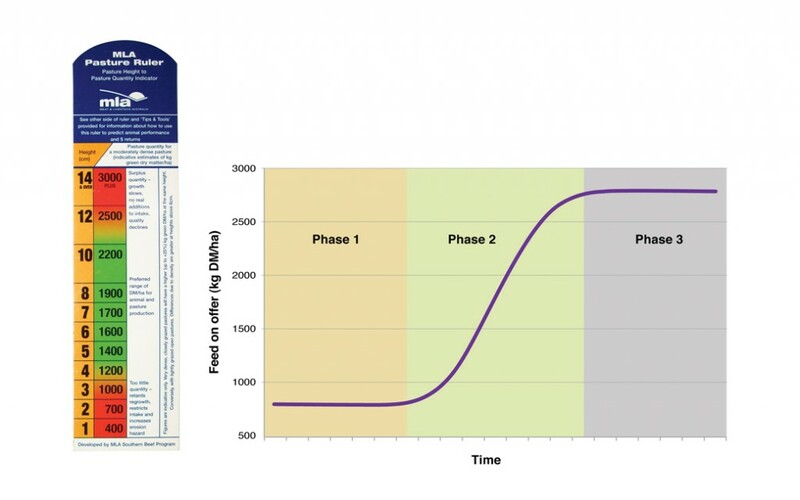 Figure 2 shows the three phases of pasture growth, and indicates that although pastures will persist at herbage mass above 800 kg DM/ha, optimum growth will occur in Phase 2. Reproductive performance will be optimised when ewes are fed according to Lifetimewool energy intake and condition targets, and cows according to Prograze guidelines. Growing stock require the highest quality feed to achieve target market weights. In addition to the herbage mass requirements to meet persistence and pasture growth objectives, the requirements of livestock also need to be considered. Table 7 under Feed Budgeting and Tactical Management provides a guide for minimum pasture quality and herbage mass requirements to maintain different classes of stock. Table 10 (sheep) and 11 (cattle) provide the energy requirements of sheep and cattle at different stages of reproduction, and can be used to determine feeding requirements for when pastures are below the minimum benchmarks. Perennials require rest after grazing, and especially at the autumn break, for tillers to restore carbohydrate levels in the roots and stem, resulting in greater rooting depth, persistence and growth. Research in Tasmania (Donaghy and Fulkerson, 1994 ) demonstrated that the perennial grass leaf-stage (number of leaves on each tiller) can provide a guide for required rest periods for recovery after grazing. The importance and length of rest varies with the targeted perennial species, the time of year and the intensity of grazing (stocking rate). The rate of leaf production on each tiller is determined by soil moisture and temperature. Therefore, rates will be higher in autumn (after the break) and spring when temperature and moisture are not limiting, while summer and winter will require longer recovery periods. 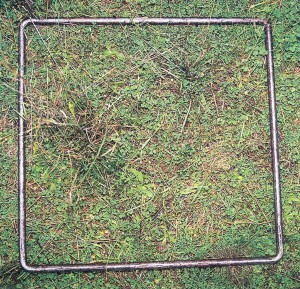 Figure 3 shows a perennial ryegrass plant recovering after grazing. As the plant produces its first leaf, energy reserves in the root and stem are depleted. With growth of each subsequent leaf, the capacity for photosynthesis is increased and energy reserves are replenished. Using leaf-stage as a guide, the optimum time to graze is when the ryegrass plant has grown three leaves and has replenished all reserves. Allowing plants to grow beyond leaf maturity can also result in loss of feed quality and death of the first grown leaves. Recommendations for leaf stages which capture feed quality while also recovering sufficient energy reserves are provided in Table 1. 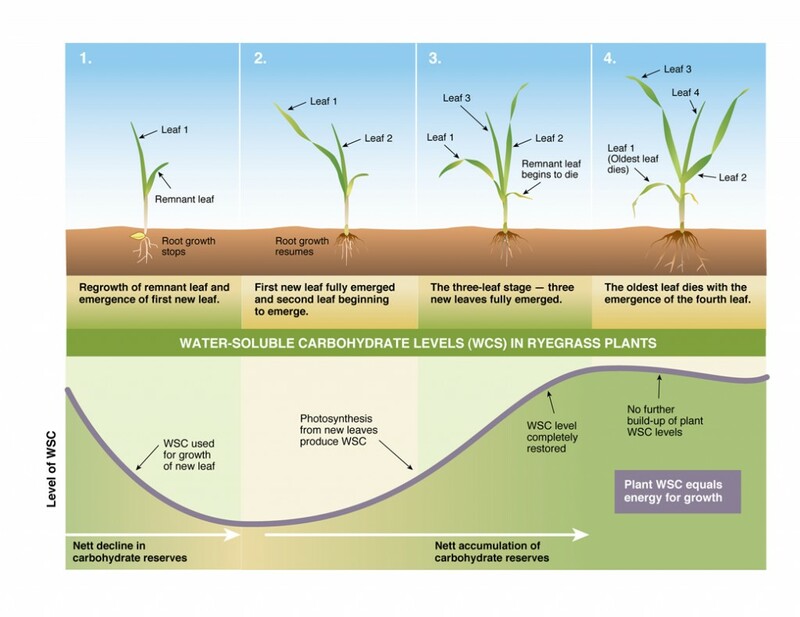 If plants are repeatedly allowed to be grazed at the one-leaf stage, energy reserves are depleted, resulting in a smaller root system, poorer access to soil moisture and nutrients and consequently reduced growth, tillering and survival. 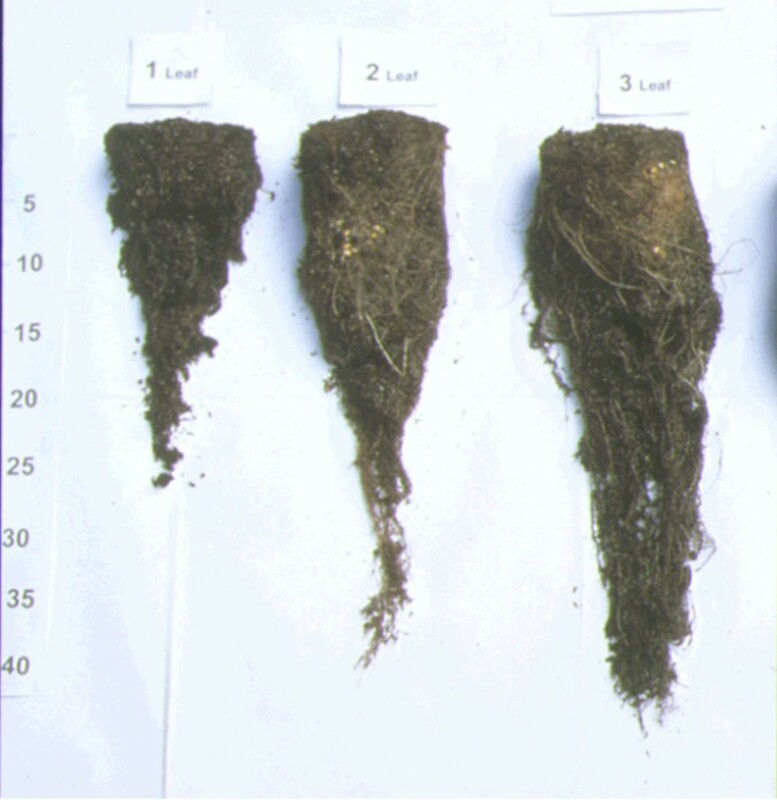 Figure 4 shows the impact on root development as a result of a ryegrass plant being cut at either the first, second or third leaf stage. The most important time for rest of perennial grasses to allow tillers to develop is at the point of the autumn break when plant energy reserves have reached minimum levels. This is particularly important in regions with a long, hot, dry summer. In these environments, the first leaves to develop are small (Figure 5). Grazing at this time can effect plant survival, reduce autumn/winter feed availability and encourage broadleaf weeds and sub-clover which require open spaces to germinate. It is less important to graze according to leaf stage at other times of the year, provided pastures are kept above minimum herbage mass benchmarks (800 kg/ha). Figure 5: The relative size of the first, second, third and fourth phalaris leaves at the point of the autumn break. Each leaf takes approximately the same time to grow. At the Broadford Grazing Experiment , the proportion of broadleaf weeds and clover were much higher under continuous grazing than rotational grazing (Figure 6), most likely due to differences in the strength of the competing phalaris and autumn bare ground. On native pastures at Orange , there was very little difference in composition between 1-Paddock, 4-Paddock and 20-Paddock systems when all systems were managed according to ground cover (70%) and herbage mass (800 kg/ha) benchmarks. 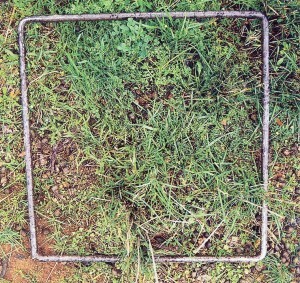 Allowing phalaris sufficient rest to recover four leaves was particularly important in autumn at the Broadford Grazing Experiment. At Broadford, the Merino wether stocking rates were pushed to maximise livestock production and utilisation, and although a 70% ground cover benchmark was in place for destocking, the pasture residual benchmark was only 500 kg/ha. Under these conditions, phalaris thrived in both a simple (four paddock) rotation and intensive (twenty paddock) rotation while it declined significantly over time under continuous grazing (Figure 6). The lack of perenniality in the set stocked treatment meant that in a dry year (2002/2003), ground cover continued to decline after stock were removed at the 70% benchmark. Rest periods required for phalaris to reach the four-leaf stage at Broadford Grazing Experiment were approximately 70 days in summer, 30-50 days in autumn (depending on the break), 40-60 days in winter and 20-30 days in spring. Management of pasture composition requires understanding of the growth pattern, fertility/pH requirements and reproductive traits of the desirable and undesirable species in the pasture. A summary of these characteristics for some of common perennial pasture species is provided here . Where undesirable species have a low response to soil fertility (eg. onion grass) and/or a high tolerance to soil acidity, the proportion of fertiliser-responsive desirable species can be increased by increasing soil fertility and/or applying lime (see Hamilton Long Term Phosphate Experiment ). Increasing soil fertility (especially through application of phosphorus fertiliser) will usually result in a higher proportion of clover, and therefore more nitrogen fixation. 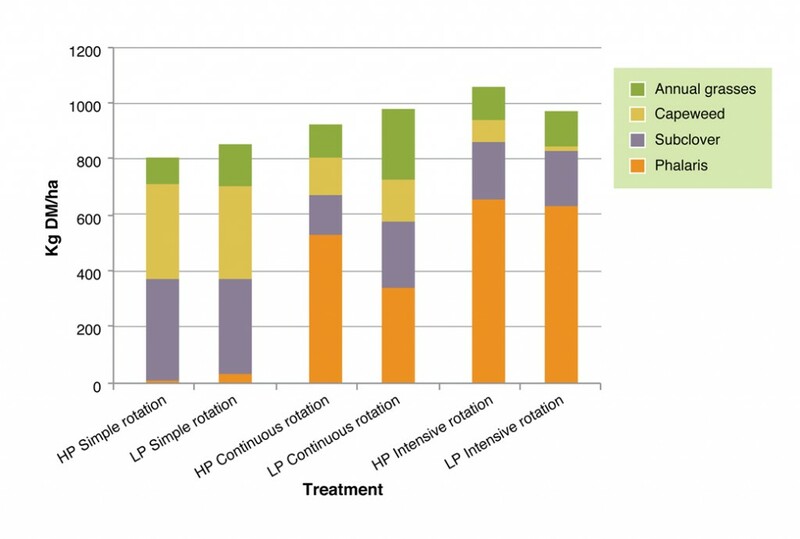 This results in higher overall pasture production from nitrogen responsive annual (eg. barley grass, annual ryegrass, capeweed) and perennial (eg. perennial ryegrass) species. In native pastures, the response of annual species to nitrogen is important for winter production and feed quality, but if left unchecked, the less responsive perennials can decline rapidly, resulting in low perenniality and low ground cover. The response of pasture species to grazing will depend on the reproductive (or spreading) mechanisms of each species. Most temperate perennial plants (eg. phalaris , cocksfoot , tall fescue , perennial ryegrass ) spread by tillering. 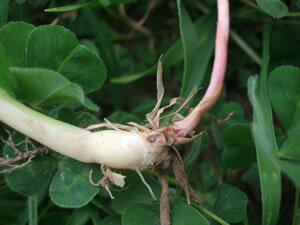 Tiller buds are formed in spring when energy reserves are sufficient. They then require light to penetrate the canopy the following autumn to enable their survival after emergence. If pastures are allowed to grow tall and rank into the autumn, new tillers are unlikely to survive, and the result is a clumpy pasture. Phalaris uses dormant tiller buds to allow it to survive hot dry summers. The process of stem elongation and seed production in spring stimulates a proportion of the tiller buds to go dormant. These buds survive on carbohydrate reserves stored at the base of the stem through the summer period. They don’t emerge until the following autumn. 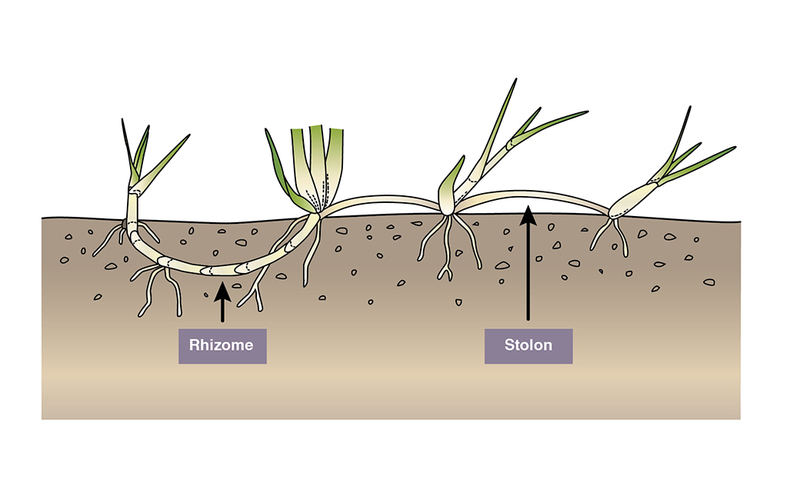 In new phalaris stands which have shallow root systems, plants which are not allowed to go through stem elongation will have a higher proportion of active buds which results in response to summer rain and a higher chance of tiller death. New tillers forming on a tall fescue plant. 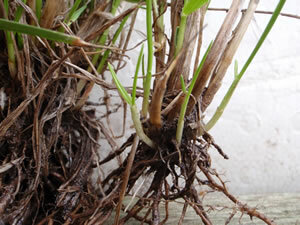 Some perennial plants reproduce from stolons (runners) and/or rhizomes (underground stems). These mechanisms make the plants more tolerant of close grazing and set stocking. In summer active plants such as kikuyu and the native perennial Microlaena, formation of rhizomes and stolons allows for rapid spreading of the plants in response to summer rainfall, when other plants are inactive. This was demonstrated at both the Chiltern and Orange EverGraze research sites after summer rainfall events in 2010 and 2011, when Microlaena significantly increased. Phalaris and tall fescue also spread by rhizomes which can be seen emerging in the bare areas at the autumn break. Annual plants need to set seed to come back the following year. Therefore, the proportion of annuals will depend on the amount of seed set, and successful germination. The rate of germination (especially for broadleaf weeds and clovers) will largely depend on the degree of autumn bare ground. Therefore, rotational grazing, autumn rests, and/or using flexible stocking rates to maintain higher ground cover and stronger perennial grasses will reduce the amount of broadleaf weeds and clover (as discussed above for Broadford Grazing Experiment ). On the other hand, to increase the amount of sub clover germination, pastures should be grazed closer to the minimum ground cover (70%) and herbage mass (800 kg/ha) benchmarks in autumn. Heavily grazing sub clover in late winter and early spring will stimulate the development of additional branches, which in turn increases the number of flowers and seeds, and results in more seedlings the following autumn. Compared to broadleaf weeds, annual grasses such as barley grass and silver grass are less affected by rotational grazing, and management to herbage mass and ground cover benchmarks. Reducing the proportion of annual grasses requires heavy grazing in early spring to reduce biomass and seeding. Later flowering perennial grasses can then be allowed to increase by growing and producing seed in late spring/summer. Chemical control of common pasture weeds should be carried out in combination with correcting soil fertility and grazing, and can be broadly divided into three main categories – spray grazing; winter cleaning; and spray topping. Other techniques are used for specific species such as use of metsulphuron methyl on onion grass, timed to interrupt the production of reproductive corms (note this has a negative effect on clovers). When using chemicals, always read and follow the instructions provided on the label. Spray grazing is used for broadleaf weed control, and involves application of a broadleaf herbicide six to eight weeks after the germination when weeds are rapidly growing (before it gets too cold but after clover has been allowed to develop three leaves). The paddock is then crash-grazed, following the withholding period of the chemical. Stock are then removed from the paddock to allow recovery of the desirable species. Winter cleaning is the most effective method for control of silver grass (Vulpia). The pasture is sprayed with simazine in early winter. Stock are removed for the recommended withholding period. Spray topping is used to prevent seed-set and re-invasion of annual grasses such as barley grass. The paddock is grazed evenly in late winter/early spring to allow for simultaneous seedhead emergence of annual grasses. From heading to the milky dough stage (for annual ryegrass apply at flowering), glyphosate is sprayed at a sub-lethal dose. Follow-up grazing then prevents further emergence of seedheads. When applying the basic principles to your farm management regime, it will never be possible to maximise the potential of both livestock and pasture production at all times. The nature of the pasture growth curve (Figure 10) is such that there will be times when minimum pasture benchmarks and rest periods will need to be guided by the need for soil protection and persistence (autumn and late winter) rather than maximum pasture growth and livestock production, so that higher utilisation can occur in spring. During late spring, herbage mass will need to enter Phase 3 so that there is enough residual to maintain herbage mass above minimum levels through the summer and into autumn. The management of different livestock classes throughout the year also needs to be considered in planning your grazing management. 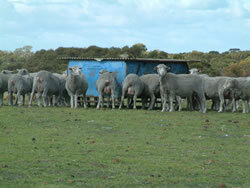 For example, to maximise lamb survival, ewes should be set stocked for lambing. Rotational grazing can be resumed after marking. Young stock will also optimise their growth potential if allocated to the highest quality pastures, set stocked and allowed to selectively graze. If rotationally grazed, they should be moved frequently and grazed on relatively short pastures (1000-2000 kg/ha) to maximise feed quality. It’s a good idea to establish pasture benchmarks and grazing rules to achieve the most important objectives throughout the growing season. An example for how this can be done is provided below. Stocking rates, lambing and calving times should be set according to minimum pasture benchmarks (for livestock and pastures) and supplementary feeding thresholds throughout the growing season. The key to meeting livestock production and pasture management benchmarks is to set appropriate stocking rates for each part of the landscape, and match peak demand associated with lambing and/or calving with peak pasture supply. Decisions relating to stocking rates and lambing/calving times are discussed in EverGraze Exchange – Livestock systems for profitable and sustainable use of perennial pastures. Whole farm winter and summer fodder budgets provided in the EverGraze Feed Budget and Rotation Planner can assist with setting appropriate feed on offer benchmarks for each month of the year. These budgets can also be used to determine where adjustments to stocking rates or lambing and calving need to be considered, where fodder or pasture growth stimulants might be needed to fill gaps, or whether fodder conservation will impact on pasture required to maintain livestock through the summer months. Including a variety of summer and winter active species. Including a variety of summer and winter active species, placed in the right part of the landscape, will provide flexibility and options for managing feed surplus and deficits in variable seasons. Fodder conservation is also important for managing seasonal variability. EverGraze research sites at Wagga Wagga (NSW) , Albany (WA) , Hamilton (Vic) , and Tamworth demonstrated that including combinations of summer and winter active perennial pasture species in the grazing system allowed for a more even distribution of feed supply and demand, reduced supplementary feeding costs and greater opportunity to finish growing stock in late spring and early summer. Including high quality forages such as lucerne or chicory in the system allowed for greater utilisation of perennial grasses in early spring while accumulating herbage mass of the summer active species for finishing young stock in late spring and early summer. Dividing up the farm for grazing management and Planning a grazing rotation provide a good starting point for setting up a grazing system. When deciding on the intensity of your grazing system, refer to the Broadford Grazing Experiment and Orange Proof Site pages , as well as the review by Geoff Saul – Grazing Systems – sorting fact from fiction . Further information will be integrated into this EverGraze Exchange as it is developed. Sargeant K (2012) Grazing management principles, how to get the most out of your pastures with grazing management. Proceedings of the 53rd Grasslands Society of Southern Australia Annual Conference, Launceston, July 2012, 11. Waller RA, Sale PWG, Saul GR, Kearney GA (2001). Tactical versus rotational stocking in perennial ryegrass-subterranean clover pastures grazed by sheep in south-western Victoria. 3 Herbage nutritive value and animal production. Australian Journal of Experimental Agriculture 41, 1121-1131.